With just under 18 million oz in gold reserves, future prospects of the company are strong. A strong balance sheet, composed of management debt and sufficient liquidity, gives Iamgold the capability to capitalize on near term projects. Issues with costs management could provide potential headwinds for the company. CôtéGold Project, when brought online, could help bring down company wide AISC (All-In Sustaining Cost). Stock could potentially provide 20-40% returnfor investors, but holds risk. With a strong balance sheet and good future prospects, the recent sell off of Iamgold (IAG) has created a potentially profitable buying opportunity for investors. Risks however, are still prevalent, and the company’s ability to better manage costs will be a key driver. Investors have not been particularly kind to gold mining stocks in recent years, and generally for good reasons. A large fall in gold prices coupled with poor capital management by industry as a whole, has left investors with a rather sour taste in their mouth. Looking forward however there may be considerable prospects for the industry as sentiment has swung to an overly bearish position, creating potentially undervalued stocks in an industry that can provide investors with portfolio diversification and an inflation hedge, the latter which may prove to be quite useful in the future. One potentially undervalued stock is Iamgold Corp, a Toronto based mid-tier gold miner producing 882,000 oz of gold in 2018, and currently holding approximately 17.9 million oz in reserves. The company has experienced recent heavy sell offs leaving it trading at market valuations close to historical lows. 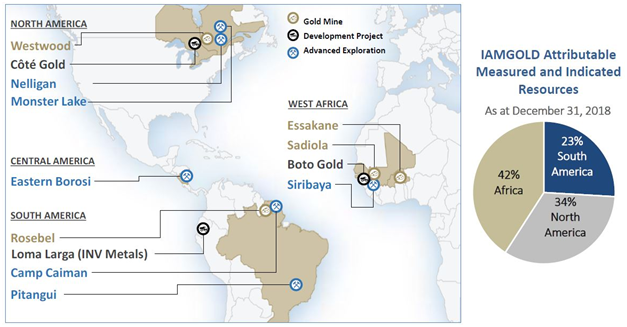 Iamgold currently operates 5 mines spanning 3 continents: North America, South America, and Africa. Within North and South America the company operates two of its 5 operational mines; Westwood located in Québec, and Rosebel located in Suriname, producing 129,000 and 287,000 oz of gold in 2018 respectively. West Africa is home to company’s main mining operation, Essakane, located Burkina Faso and producing 405,000 oz in 2018. In addition to Essakane the company operates two joint venture projects located in Mali; Sadiola and Yatela, producing a combined 61, 000 oz in 2018. The company’s ownership of each mine is as follows: Westwood (100%), Rosebel (95%), Essakane (90%), and Sadiola and Yatela (41%). With wide spread operations, Iamgold provides a nice mix of geographical diversification within its asset holdings. However cause for concern could arise for its mines located in Suriname and West Africa as the regions could prove less politically stable in comparison to Canada. A development project located in Ontario, Côté, may serve to alleviate some of these concerns (more on the project later). 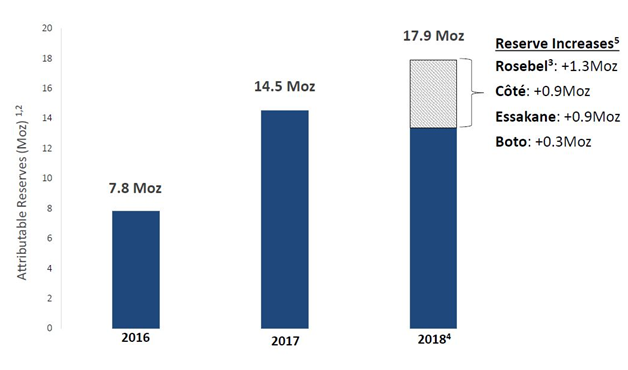 In general however the regions do not pose any major near term cause for alarm, and thus should not create a discount to Iamgold shareholder value. In spite the hard times that have fallen on the gold mining industry, Iamgold has been able to maintain a relatively strong balance sheet that puts it in a position to weather future problems, if they were to come. The company has done a good job of using internally generated capital to fund its current operations and development projects. This has allowed the company to avoid the need to draw on debt markets, and keep leverage low. In addition it has been able to reduce its long term debt by approximately 40% from 2014 to present day. 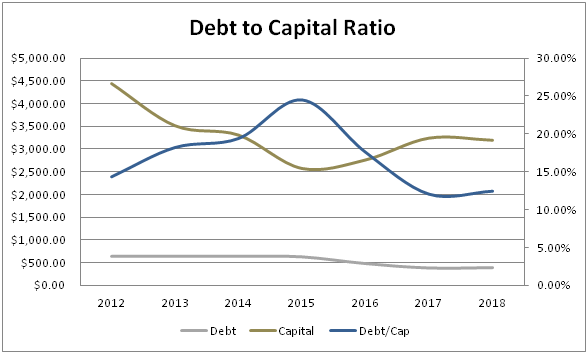 It can thus be noted here that Iamgold’s ability to keep overall debt levels relatively low frees up the company’s cash flows from the burden of large financing costs, a positive sign for the future earnings potential. Another positive can be seen through the company’s strong near term liquidity. With no major contractual obligations coming due within the next 5 years, aside from a manageable purchase obligation, the company has freed up near term cash flows that can be used towards either further strengthening its balance, or funding development projects. The company’s ample cash and credit available make the latter option a relatively likely scenario, and with promising projects currently in development, this could potentially create greater value for shareholders in the future. 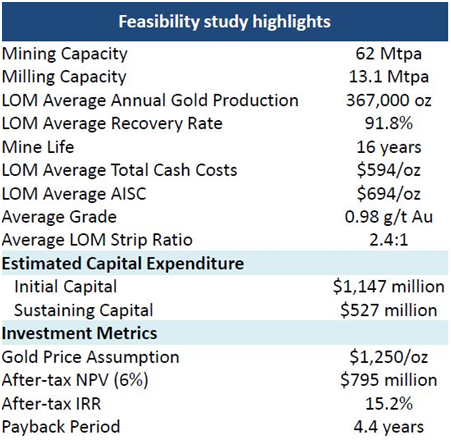 It should also be noted here that the large cash balance, and little long term debt, potentially makes Iamgold a candidate for acquisition from a larger gold miner, or sets up Iamgold to seek further growth through an acquisition of its own. When it comes to the former scenario, the analyst would be wise not to use this to upwardly revise their valuation for a few reasons. Firstly, front running potential acquisition candidates is a very difficult investment strategy that typically requires a large amount of insider know how, and would not be wise for the average investor. Secondly, it is not, at this stage, uncommon to see a no premium acquisition in the gold mining sector, given the past trend of greatly overvalued acquisition. This potentially leaves the investor without the upside buy-out they may have paid for. As for an acquisition by Iamgold, with a relatively healthy pipeline of further developments projects, it doesn’t seem that this would be as likely scenario currently, however investors would be wise to monitor any potential news updates moving forward. In a highly volatile industry such as gold mining, a strong balance sheet such as Iamgold’s may leave investors to believe that the company has done a relatively strong job in managing its cash flow and earnings. With Iamgold however this does not appear to necessarily be the case. The company has persistently run into issues over the past number of years when it comes to earnings, as can be seen by the deterioration in the company’s profit margin. An obvious issue arising for all gold miners, not just Iamgold, was the sharp drop off in gold prices following 2012. The fact that profit margin deteriorated during this time should not come as a surprised, but what does lead to more concern is Iamgold’s inability to more adequately manage these downturns due to a higher all-in sustaining cost (AISC). 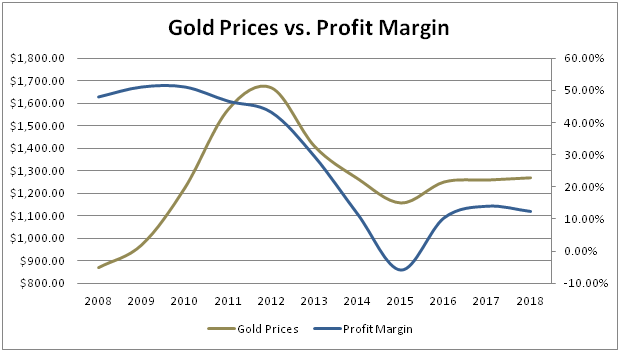 The graph below dictates this issue, with profit margin showing greater deterioration than the drop in gold prices may have suggested, this is a common problem for gold miners with above average costs. As can be seen below, Iamgold’s AISC is not typically at par with some similar competitors in the industry, leaving something to potentially be had for Iamgold investors. This has been a relatively consistent problem for Iamgold, but not one that the company has not at least made some modest gains towards fixing. Moving forward investors would be wise to keep a close eye on this issue, as it has the potential to substantially impact the company’s future success. 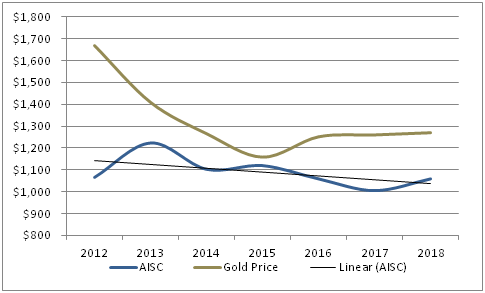 If the company cannot address its AISC moving forward, a falling gold price could be potentially detrimental, and see its strong balance sheet disappear. With a healthy balance sheet currently in place, Iamgold has the capacity to develop strong projects moving forward which may help alleviate some of the issues it is currently facing with its earnings. One of these developments is its Côté gold project located in Ontario. A feasibility study had been completed for the mine site and shows some promising preliminary figures, it must be noted that these numbers should not be taken in whole, as a discount to any figures should be incorporated to account for any number of issues that can arise during resource extractions. A 5-10% discount (or increase when referring to costs) should suffice. One thing analyst can point to is the lower than average AISC for Côté. With the potential to produce a fairly sizable amount of gold, this lower AISC would help correct some of the issues facing Iamgold, such as its deteriorating profit margin. Investors should however not expect any rapid developments from this project, as management has previously released a statement, indicating that construction for the project has been put on hold, awaiting “improved, and sustainable, market conditions in order to proceed with construction”. (Iamgold News Release) What exactly these market conditions are has not been made clear, however it is still generally expected that construction could resume within the next year or two, and not likely outside of three. Iamgold has over the past years been able to do a good job of growing its gold reserves and steadily bringing these reserves into productions. The recent downgrade in estimate for 2019 production in oz was one of the leading catalyst for the fall in share price, but for a company who has struggled with efficiently managing its costs, this should not necessarily been seen as a negative for the firm, as many have made it out to be. Generally when a firm is focusing on more efficiently managing costs, further increases in production output are not always a good sign. As managing costs become more difficult with a growing production, investors would be wise to rather see the company temporarily slow its production, in order to efficiently manage current costs, and set up more sustainable production moving forward. Recent jobs cuts at the Westwood mine (Iamgold News Release) may be an early indication of management’s commitment to this cause. For a price valuation I have opted to lay out a number of relative measures to determine an appropriate trading range for Iamgold, such as Price to Book, Sales, and Cash Flow. Below a range for each ratio can be seen. Using a combination of these valuations I believe it would be appropriate to set the expected price range for Iamgold in the $4 – $5 range. The investor could also lean on the EV/EBITDA ratio for an appropriate valuation. In this case using a ratio of 7-8, roughly in line with the broader industry, would yield a price range of $4.12-$4.65, generally in line with the price range using the Price to Book, Sales, or Cash Flow. It must be noted here that these valuations are based around a relative bullish stance when it comes to the price of gold. Gold mining stocks are largely leverage bets on gold, and any investor looking to capitalize on what they believe to be strong future gold prices would be wise to pursue investment within these companies. Overall Iamgold’s strong balance sheet with low debt, and a fairly large amount of cash available, set up the company to execute on future projects and provide growth in value for investors. Cost management has been a persistent issue for the company in the past, and thus should be monitored for progress moving forward. Investors looking to add a position within the gold mining industry would be wise to look towards Iamgold, as although it contains its share fair of risk, the potential upside of 20-40% provides sufficient incentive. Authors Notes: I do plan on publishing, within the near future, an article outlining my bullish stance when it comes to gold prices, using a macroeconomic approach. If you enjoyed this article and would be interested in an article on the prospects of gold prices, please follow my page to receive a notification when it is published. Disclosure: I/we have no positions in any stocks mentioned, but may initiate a long position in IAG over the next 72 hours. I wrote this article myself, and it expresses my own opinions. I am not receiving compensation for it (other than from Seeking Alpha). I have no business relationship with any company whose stock is mentioned in this article.